Too many projects for one book? Oh oh…. 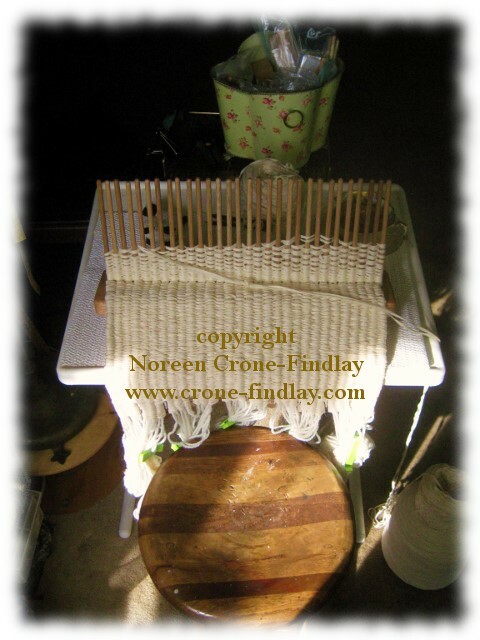 I am so inspired by my new book about peg loom weaving that I am coming up with waaaaaaaaaay too many ideas for it…. And, then, instead of carrying on with figuring out yardage etc and working on the forms I have created to help me track my progress and keep everything organized… I stopped and played…..
That’s not going to get a book written, is it? (Voice of Inner Child: But look! I can draw things with my weaving sticks! Whee! All right, all right…. I really am getting back to work now. Wheee! I am so excited! I can finally share my good news! For months, I have been sworn to secrecy, but now….the contracts are signed…. so……..
My editor has given me the go ahead to let the cat out of the bag. Stackpole Books is going to be publishing my new book about Peg and Stick Loom Weaving. 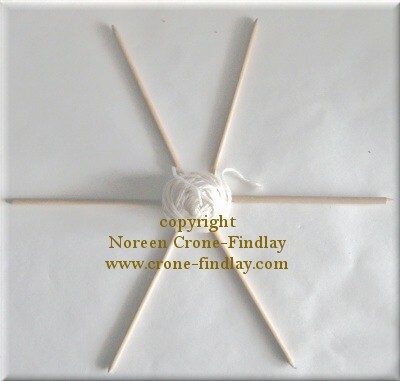 I love peg looms and stick weaving- they are simple little looms, but have incredible creative potential. And, I’ll post pics of some of the tapestries that I have woven on the Peg Loom soon, just to show a bit more of the potential of these delightful looms. For the new book, I have designed oodles and oodles and oodles of new designs- oh my! I am so excited!!!!! And…. I am covering all kinds of awesome techniques right from the very basics up to advanced and slightly boggling ways of working with the peg loom. (And weaving sticks, too). I’ll be working my sweet little chops off from now until June of 2015, when the manuscript, photos, illustrations and diagrams take flight to land in the capable hands of my editor and her clever cohorts. They will then spend months making magic with it, (so much happens to the text, photos, diagrams and illustrations once the wizards of technology at Stackpole Books get their hot little hands flying!). Then, the book comes back to me for my proofreading, and back to them and then, it takes flight again, off to the printers. That’s why it takes another whole year before it can miraculously pop up on book shelves. It’s worth the wait 🙂 I hope. I’ve asked my editor if it’s okay to share my journey with writing the book with you, and she has said yes, as long as it doesn’t upset people that they have to wait so long for it. There is soooooooooooo much involved in writing a book, and I find it very interesting, so I hope that you will, too. (And of course, I can’t let the cat out of the bag about the exact projects until the book is closer to release, but then, I’ll be able to share ALL the pics). But, now…. I must get back to work! I love the poem, ‘She Walks in Beauty Like the Night’ by Lord Byron…. and the beauty that exists in us, and those whose lives we walk with. Also, it makes me think about the ways we treat the night in our culture. We’re a little (or a LOT) afraid of it, aren’t we? 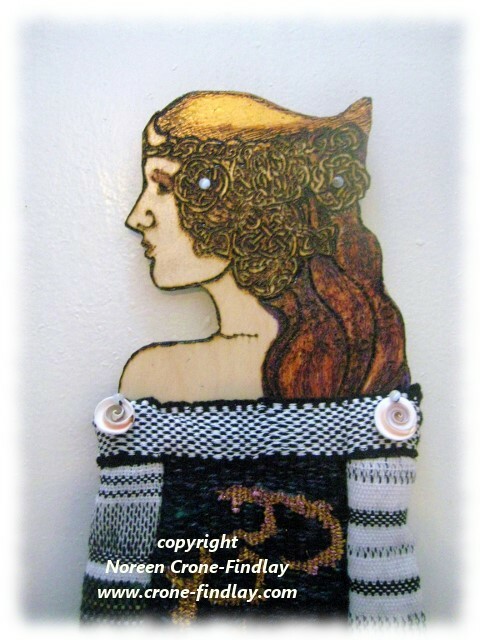 not so much bigger than we are…..
‘She Walks in Beauty Like the Night’ was woven on my 8 inch Mirrix tapestry loom at 8 epi and 4 epi (I wanted to add a lot of texture, so I took a chance and by going with what is considered to be a whalloping HUGE scale of weaving. Her arms were woven on my 4 harness loom at 30 ends per inch. The narrow bands at her shoulders and wrists were woven on my inkle loom. I drew the face, hands and feet on Baltic Birch plywood and cut them out with the bandsaw, sanded, sanded and filed the edges. Then I burned the pencil lines with a special rheostatic wood burner that my lovely, brilliant husband, Jim Findlay, LINK designed and built for me. Next step was to do some encaustic work with laying color in with beeswax, and melting it in (without setting fire to everything, ahem- that does put a crimp in the day….). Then, layers of acrylic paints, more beeswax, and then the wooden pieces were all varnished. 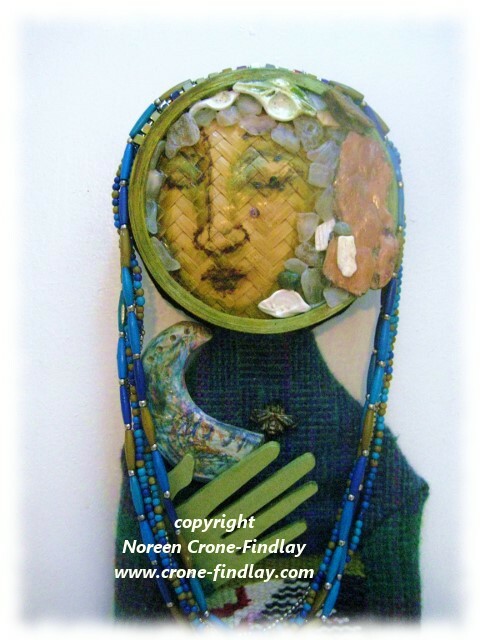 I drill holes in at their edges so they can be stitched securely into the tapestry. ‘She Walks in Beauty Like the Night’ is just over 36 inches tall. I am enchanted with weaving words these days, which has all manner of challenges, but it has absolutely captured my imagination. I find weaving words to be utterly delicious, and phrases and fragments of favorite poems are jumping up and down, leaping through my dreams, marching through my mind or dancing on the edges, demanding to become Woven Women. So, what am I to do? Warp up the loom and keep weaving, of course! My beloved daughter in love, (light of my son’s life, my dear friend, and a total treasure), Alliston Findlay, is a master hand spinner. 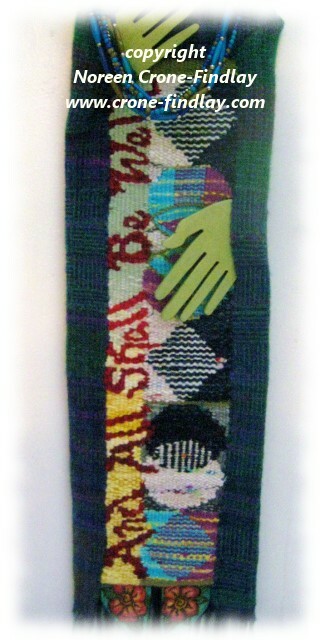 Her handspun yarns are the richly shaded blacks in ‘She Walks in Beauty’. Weaving tapestry with bundles of metallic threads (I used 3 or 4 strands of the metalics and blending threads held together) is VERY slow and definitely challenging, but SO worth it. When I was steaming the tapestry after it came off the loom, I was VERY careful, as I was worried that I might melt the threads. Luckily, they stood up to the steaming and finishing process just fine- whew! Finishing a tapestry is one heck of a lot of work, but that’s another story. For now, let me leave you with the wish that you, too, will walk in beauty like the night, through all the moments of your beautiful life! PS:I was told last week that Lord Byron wrote the poem because he deeply honoured and respected a young woman who struggled with cerebral palsy. Apparently, this made it difficult for some people to see her true beauty. This makes me love the poem even more!